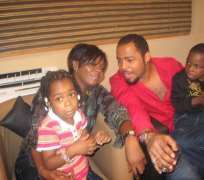 introducing actor ramsey nouah and his lovely family! RAMSEY TOKUNBO NOUAH JNR:NOLLYWOODS SWEETHEART. Like it or not,ramsey is one of the most loved actors in nollywood! Born in Edo,Nigeria, Nouah (often misspelt 'Noah') is of Nigerian and Israeli parentage. (his father is of Israeli and Lebanese descent,while his mother is Yoruba, hailling from Owo,Ondo.) Before gaining popularity as a Nollywood actor,Nouah had been a Hip hop artiste with fellow actor Pat Attah and the pair starred in the Nigerian soap opera 'Megafortunes' . He has been dubbed "Lover-Boy" for his numerous roles in romantic movies.ramsey is grateful to God for fame but according to him''My only is regret is the fame,I wish I could have a more private life''. Ramsey is married to emilia and the couple have two lovely children together.the awards and nominations due to ramsey are nowhere documented on the world wide web and the actor has no COMPREHENSIVE biography online. We hope the year 2009 brings him more success on his day job. CONGRATULATIONS to him on his becoming an ambassador for telecomunications giant globacom.